Have you ever considered how far you walk with your dog? If you walk just 15 minutes a day you will have walked far enough in your dog's lifetime to cross the United States. With all that walking ahead of you, aren't you ready for a new place to take a hike with your dog? DOGGIN' THE MID-ATLANTIC: 400 TAIL-FRIENDLY PARKS TO HIKE WITH YOUR DOG IN NEW JERSEY, PENNSYLVANIA, DELAWARE, MARYLAND AND NORTHERN VIRGINIA explores the area's top trails with your best friend in mind. This new guide for the active dog owner rates and evaluates 400 regional parks that welcome dogs. No Dogs! Is there any more dispiriting day for a dog owner than driving to a new park and encountering the dreaded "NO DOGS" sign? DOGGIN' THE MID-ATLANTIC tells you the parks that don't welcome dogs. Also packed inside these 464 pages are... ...regulations for over 300 campgrounds for dogs ...tips on outfitting your dog for a hike ...tips on practicing low impact hiking with your dog ...and much more. 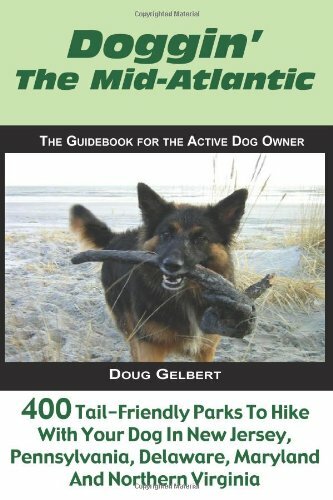 The Middle Atlantic states are a great place to hike with your dog. Within a short drive you can be scaling mountains that leave your dog panting, exploring impossibly green glens that will set tails to wagging, walk on some of the most historic grounds in America or circling lakes for miles where swim-loving dogs never sight of the water. While walking the dog, author we bring along generous helpings of local history, botany, geology, architecture and more. What makes a great place to take your dog hiking? Well, how about a paw-friendly surface to trot on? Grass and sandy dirt are a lot more appealing than asphalt and rocks. A variety of hikes is always good - long ones for athletic dogs and short ones for the less adventurous canine. Dogs always enjoy a refreshing place to swim as well. For tail-friendly parks our guides describe the trail options for your dog, evaluate park traffic from other users, tell you whether you will need a guide dog to find your way around and, of course, tell you how to get to the park.